Oh No! The Troops need Bibles! Tim Todd Ministries, "Revival Fires Newsletter" is breathlessly reporting a non-existent problem in order to drum up business for his organization. make sure they all have Bibles! Our soldiers serving in Iraq and Afghanistan should not be sent into battle without Bibles! Oh no! Our soldiers don't have Bibles! The Horror! As someone who served in the US Air Force for 10 years - I find it really difficult to believe that Bibles are so hard to get. In fact, 3 of the Bibles that I currently own are from 3 different assignments. Keesler AFB, Camp Red Cloud, and Kadena AB. Where can a military member get a Bible while on assignment? I got two of my Bibles from an Army / Air Force Exchange System (AAFES) bookstore. Neither were very expensive. Another was given to me by the USO. But I wasn't holding a rifle on the front line - so I'll admit my experience probably isn't the same as a front-line soldier. Even so - Afghanistan and Iraq both have fully stocked AAFES PX / BX. For the troops nearby, it would be an easy matter to walk in and purchase a Bible during a little down time. And for those who are not near an AAFES, they would still have the occasional opportunity to do a little personal shopping. Use the AAFES Downrange Store Locator to find the nearest AAFES. 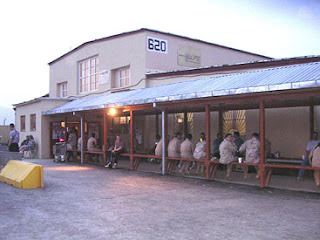 Here's an image of part of the PX located in Bagram Afghanistan. The military does make some provisions for members for free. When I was in Basic Training, I recall very clearly when the Chaplin told us that if anyone wanted a Bible, we were welcome to one. All we had to do was ask. There was even an official cross that we could ask for. And if you're wondering where these items might come from - well they are provided by the military supply system! All it took was a word to the company clerk and you could also have one of these items in your possession. And if you didn't want to go through the official channels, a simple word to the military Chaplin would get you what you needed. Now, the entire catalog is available online. You can find it here. (If you are in the military, use your military order system.) I took a moment to see what was available. Here's one publicly accessible portion of the supply system. In the "Name Keyword(s)" box, type the word "Bible" and hit 'Enter'. Oh my! Look at that - a page of results that include various versions of the Bible - and those have various covers too! You want a bible with a desert cameoflage cover? It's there! A bible map set, a Spanish bible? It's there too! And what if we search for the word, "Necklace"? One of the hits is a wooden cross necklace. You could also search for crucifix, but that returns large (as in 6 foot tall) crucifixes used for chapels. There is something a bit odd. When I searched for the Koran, I got no results. Neither did I get anything from searching for the Quran or Qur'an. Islam did get some results, but those results dealt with how a soldier might handle someone of the Islamic faith. Muslim seemed to give results at first, but those led to dead ends. I guess if you are a US soldier of the Islamic faith you won't have the same opportunity to worship. Maybe Tim Todd should be sending copies of the Qur'an? The keyword "Jewish" returns several hits... but "Atheist" and "Atheism" returns nothing. My point in all of this isn't just to show that sending Bibles to troops isn't necessary. I'm trying to point out that there are several ulterior motives that religious ministries are indulging when they hyperventalate about "Soldiers needing Bibles". First, this is a solution to a non-existent problem. There are enough Bibles in country for any troop who wants one. It might be a bit difficult to distribute the bibles to individuals, but that would be due to a lack of interested volunteers. And distribution is a problem regardless of the origin of the bibles. Second, sending bibles has a high return on investment for Tim Todd. Not much effort is required for a result that includes a great deal of self-congratulation. With a little effort a religious group can look very good, which is also good for business. The bibles are purchased by parishioners, then delivered to an APO / FPO point, where the military then subsidizes the cost of delivery. Tim Todd pays domestic postage only - if that. And I'm sure his costs are offset by other donations. Third, this program is aimed at converting soldiers when they hit their lowest point. A soldier drowning in war will grasp at any stray to stay afloat. These soldiers don't need fairytales and empty platitudes - they need help. They need friends, an ear to listen to them, professional counselors to keep them sane. Fourth, this program is divisive. Evangelical methods create evangelists. The military has already demonstrated that members will apply a great deal of peer-pressure to the non-Christian. In some cases, outright discrimination takes place. Divisiveness is NOT a trait you want to encourage in a team that is supposed to work together in a firefight. Lastly, this program will saturate a non-Christian country with Bibles. When there are more bibles than there are soldiers who want them, evangelical minded soldiers may try giving them to the local Islamic population. It's for their own good, right? They won't mind. You want to send a soldier something? Don't bother with sending them a Bible. If they're near an AAFES then send them a gift certificate. If they are not, then send a donation through the USO. You can also just send our soldiers a message of support. That makes a lot more sense than sending a Bible, or worse, putting a yellow sticker on your SUV.